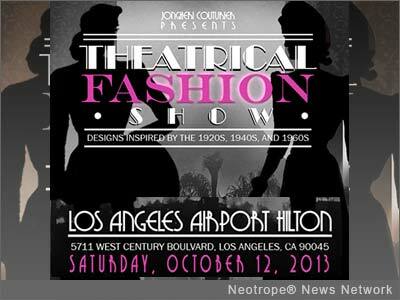 LOS ANGELES, Calif. /California Newswire/ — Jon Gheri presents "Theatrical Fashion Show" at 5711 W. Century Blvd, Los Angeles, CA 90045, on Saturday, October 12, 2013. Red Carpet begins at 3:30 p.m. Hors d'oeuvres will be served during the event. The show begins at 4 p.m. featuring fashion designs influenced by the 1920's, 1940's and 1960's along with songs from popular recording artist from each of these eras including Billy Holliday, Julie Garland, Nat King Cole and many more. The program will feature designers Gheri Legree of Jon Gheri Couture and new designers from Nourishing Minds of our Youth; a nonprofit agency providing mentoring programs for middle and high school young women in the Pasadena area. Fashion Fair Print Model Trisha Mann will emcee the evening with songs from special guest artists Tony Grant, Keysha Ealy and more. The Theatrical Fashion Show is a Launch for Nourishing Minds of our Youth. A portion of the proceeds from the show will go to the charity. NMOY is a nonprofit agency providing mentoring programs for middle and high school young women in the Pasadena area. The program will form partnerships with local school districts and the goal is to foster a commitment to these young women that will promote pro-social friendships, strong interpersonal skills, and reassert a sense of hope in the future. Couturier Jon Gheri became known for her made to measure, custom designed wedding gowns. Jon is passionate about couture which shines through in every garment created by herself and her dedicated team. She has lived and breathed design from a very young age from creating couture gowns for her dolls to formal gowns for her own formals and now creating unique and stunning designs for her clients. Her recent works include fashion, theatrical design as well as independent consulting. The show ends at 8 p.m.
Tickets for this exclusive event are $60 and can be purchased through http://jonghericouturier.com/ . For further information contact Pamela Sankey at 888-278-4404.